#1. This week's number one is former U16 international power forward Cheick Diallo (206-96, college: Kansas, currently plays in NBA). 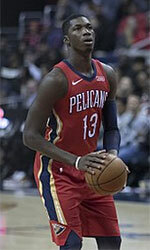 He led New Orleans Pelicans to an easy victory against the Dallas Mavericks (20-45) 126-109 in the NBA in Sunday night's game. Diallo had a double-double by scoring 13 points and getting 15 rebounds. He also added and 3 steals in 23 minutes on the court. The New Orleans Pelicans have 38-26 record this season. It was his team's tenth consecutive victory in a row. This year Diallo averages: 4.1ppg, 3.3rpg, 2FGP: 54.1% and FT: 74.3% in 35 games he played so far. He played for the Mali U16 national team seven years ago. #2. Second place goes to former U18 international forward Sagaba Konate (203-97, currently plays college basketball in the States), who plays in the NCAA. Konate could not help the W.Virginia (11-7) in their last game on Saturday. Despite his good performance the W.Virginia was defeated 87-79 at home by the The University of Texas. Konate scored 14 points and grabbed 8 rebounds. His team will play only one more game in the NCAA Regular Season. And that game will be critical. Konate has relatively good stats this season: 10.5ppg, 7.7rpg, 3.3bpg, 2FGP: 51.4% and FT: 78.6%. He played for the Mali U18 national team in 2014. #3. The Mali player who performed third best last week abroad was an international center Diarra Moustapha (204-87, college: USF, currently plays in France). Moustapha was not able to help Denain Voltaire in their game against Nantes (7-14) in the French ProB (second division). He was the second best scorer with 9 points. Moustapha also added 4 rebounds in 25 minutes. But Denain Voltaire lost 53-66 on the road to the lower-ranked (#14) Nantes. It's Moustapha's first season with the team. This year his overall stats are: 8.5ppg, 3.0rpg in two games. Moustapha has a dual citizenship: Mali and French. He is also a member of the Mali senior national team. #4. Power forward Nianta Diarra (205-93, agency: Two Points, currently plays in France) was not able to secure a victory for Olympique Antibes (9-12) in their game against JSF Nanterre (12-9) in the French ProA. Diarra scored 6 points and grabbed 4 rebounds. Olympique Antibes was badly defeated 89-70 in Nanterre by the much higher-ranked JSF Nanterre (#5). Diarra's total stats this season are: 4.2ppg and 4.4rpg. He is another player who holds two passports: Mali and French. Diarra is also Mali national team player. #5. International forward Cheick Soumaoro (204-90, currently plays in France) contributed to an easy victory against the 13th-ranked SO Maritime Boulogne (10-14) crushing them 85-51 in the French NM1 (third division) in Tuesday night's game. He scored 6 points and grabbed 4 rebounds in only 8 minutes. Saint-Quentin Basket-Ball (17-7) is placed fourth in the NM1. This year Soumaoro's total stats are: 6.7ppg and 4.3rpg in nine games. He plays currently for the Mali national team. #6. Forward Namory Boundy (202-89, currently plays in France) couldn't help SO Maritime Boulogne (10-14) in their game against Vendee Challans (15-9) in the French NM1 (third division). He cannot count Saturday's game as one of the best ones. Boundy scored only 3 points in 15 minutes. SO Maritime Boulogne was crushed 94-69 in Challans by the much higher-ranked (#6) Vendee. It was SO Maritime Boulogne's fourth consecutive loss in a row. Boundy has averaged so far 5.3ppg, 2.3rpg and 1.8spg in 24 games. He is a former international player as he played for the Mali senior team three years ago. #7. Former international point guard Ibrahim Saounera (179-87, currently plays in France) led Vendee Challans to a 1-point victory over the 12th-ranked Brissac-Aubance (10-14) 80-79 in the French NM1 (third division) on Tuesday night. Saounera was MVP of the game. He scored 21 points, had 4 rebounds and dished 7 assists. Vendee Challans Basket (15-9) is placed sixth in the NM1. It was his team's seventh consecutive victory in a row. This season Saounera has relatively solid stats: 11.2ppg, 2.5rpg and 5.5apg. He used to play for the Mali national team three years ago. #8. Center Drissa Ballo (208-95, currently plays in France) managed to help ADA Blois Basket 41 in a victory against the closely-ranked Entente Orleans 45 (17-4) 98-81 in the French ProB (second division) on Friday night. He scored only 4 points in 13 minutes. It was the game of the round between two top 4 ranked teams. ADA Blois Basket 41 (17-4) is placed first in the ProB. It was his team's fourth consecutive victory in a row. Ballo has averaged so far 4.5ppg and 3.2rpg in 20 games. He plays currently for the Mali national team. #9. An experienced former international guard Ludovic Chelle (183-83, currently plays in France) led Caen to an easy victory against the 16th-ranked STB Le Havre (6-15) 88-69 in the French ProB (second division) last Friday. He scored 11 points in a mere 15 minutes. Caen Basket Calvados (8-13) is placed 12th in the ProB. Chelle has averaged so far 9.4ppg, 1.4rpg and 2.3apg in 18 games. Despite he played previously for the French U20 national team, Chelle is currently in the Mali national team roster. #10. Forward Mamadou Sy (196-85, college: Cloud County CC, currently plays in France) faced previously mentioned Ibrahim Saounera in the French NM1 last game. Sy couldn't help Brissac-Aubance (10-14) in their game against Vendee Challans (15-9). He scored only 4 points, had 7 rebounds and dished 5 assists. 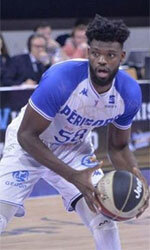 Brissac-Aubance was edged 80-79 in Challans by the higher-ranked Vendee (#6). Sy has averaged so far 5.2ppg, 4.7rpg and 1.9apg. He is an international player who is currently on the senior Mali National Team roster. #1. Mambi Diawara (195-G/F-94, college: Lamar St.CC, currently plays in Canada) led University of Calgary to a 2-point victory over the Badgers (6-18) 78-76 in the Canadian university league CIS last Thursday. He was MVP of the game. Diawara recorded 19 points, 7 rebounds, 3 assists and 3 steals in 36 minutes. The University of Calgary has a very solid 16-4 record this season. It was his team's third consecutive victory in a row. Diawara has individually a very good year with high stats. He averages: 21.1ppg, 7.2rpg, 3.4apg and 2.3spg in 24 games he played so far. Diawara has a dual citizenship: Mali and Canadian. Despite his Mali passport, Diawara currently plays for the Canadian university national team and is not eligible to play for the Mali team. #2. Tahirou Diabate (206-F-98, currently plays college basketball in the States), who plays in the NCAA could not help the one of league's weakest teams Portland (4-14) in their last game on Saturday. Despite his good performance the Portland was defeated 78-72 at home by the Loyola Marymount University. Diabate scored 14 points and grabbed 7 rebounds. The Regular Season already ended in the NCAA. Diabate's total stats this season are: 6.4ppg and 4.2rpg. #3. Nouhoum Bocoum (208-F/C-94, college: Arkansas St., currently plays in Spain) was not able to help CB Guadalajara in their game against Real Madrid II (18-4) in the Spanish EBA (fourth division). Despite his very good performance last Sunday Bocoum was the top scorer with 14 points. He also added 3 assists. This season Bocoum has relatively solid stats: 13.9ppg and 6.4rpg. He is another player who holds two passports: Mali and American. #4. Salif Boudie (205-F-95, currently studies in the States) was not able to secure a victory for the Arkansas St. (6-12) in their game against the University Louisiana at Lafayette in the NCAA, despite his good performance on Friday night. Boudie scored 11 points and grabbed 8 rebounds in a mere 16 minutes. Buthis team lost 74-85 on their home court in Jonesboro to the University Louisiana at. The Regular Season already ended in the NCAA. Boudie has averaged so far 3.6ppg and 4.0rpg in 24 games. #5. Bourama Sidibe (208-F-97, is currently at the American university) couldn't help the one of league's weakest teams Syracuse (8-10) in their game against the University of North Carolina (4-12) in the NCAA. He recorded only 4 points and grabbed 10 rebounds. The Syracuse was badly defeated 78-59 on their home court in Syracuse by the University of North Carolina. The Regular Season already ended in the NCAA. Sidibe has averaged so far 2.9ppg and 3.5rpg. #6. Mamadou Doucoure (206-C, currently plays college basketball in the States) couldn't help the Rutgers in their game against the Purdue University in the NCAA. Doucoure cannot count Saturday's game as one of the best ones. He scored only 3 points and grabbed 4 rebounds in 9 minutes on the court. His team lost 75-82. Doucoure has averaged so far 2.9ppg and 3.1rpg in 32 games. #7. Bakary Konate (211-C-93, currently plays college basketball in the States) couldn't help the Minnesota in their game against the Rutgers, The State University in the NCAA. He cannot count Thursday's game as one of the best ones. Konate recorded only 2 points. His team was defeated 65-54. Konate has averaged so far 1.7ppg and 3.5rpg. #8. Cheickna Dembele (211-F-96, currently plays college basketball in the States) couldn't help the UNLV in their game against the Utah State University in the NCAA. Dembele cannot count Sunday's game as one of the best ones. He recorded only one point. His team were defeated 79-67. Dembele has averaged so far 1.5ppg and 1.2rpg. #9. Ibrahima Sidibe (180-PG-95, currently plays in France) couldn't help Caen in their game against Charleville-Mezieres in the French ProB (second division). Sidibe scored 7 points in 17 minutes. His team lost 76-87. Sidibe has averaged so far 4.8ppg, 1.2rpg and 1.9apg in 18 games. He has both Mali and French nationalities. Despite Sidibe's Mali passport, he previously played for the French U20 national team and probably cannot be called to the Mali team. #10. Thimothee Troussel (201-F-95, college: MSU-West Plains, currently plays in NCAA2) couldn't help the Newman University in their game against the St. Edward's University in the NCAA2. Troussel cannot count Friday's game as one of the best ones. He scored only 3 points. His team was defeated 71-62 in the NCAA2. Troussel has averaged so far 6.1ppg and 3.8rpg. He also holds two passports: Mali and French.